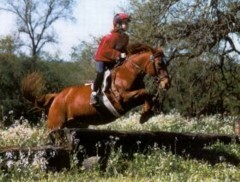 One of the greatest thrills from riding is learning to jump over the "fences". The fence is made up of "rails", that can be easily added or removed to make the jump higher or lower. You start out with little baby "jumps" about a foot high and then progress upwards from there as your abilities allow. Riders follow a pattern around the arena jumping over fences of various heights. You are timed and judged on your riding abilities and demeanor, along with the horse's abilities. The course is set up though the woods and fields, with a specific pattern to follow. Judges are stationed at each jump to grade you, and you are timed. Both show jumping and cross-country can be a class in a horse show, or one of the legs of a three-day event that includes dressage. When the rider prepares to jump, she goes into a "two-point" or jumping position, putting her weight on the balls of her feet. Lift yourself slightly out of the saddle and lean forward. Then keeping her back straight, she lifts herself slightly out of the saddle and leans forward. She will stay in this position while the horse is in the air, going back to her normal riding position when the horse touches the ground. Some riders will hold onto the mane, it won't hurt him. Shorten your stirrups two holes, unless you use long stirrups. To keep your horse interested, don't jump the same jump over and over. If your horse refuses, make sure you take it again, and put leg pressure on the side that he ducks to. At first an inexperienced rider should use a neck strap so that there is no risk of a nervous or frightened rider pulling hard on the reins and jabbing the horse in the mouth with the bit. For the approach, sit down in the saddle, keeping close contact with your legs and the horse. Support your weight with your thighs and feet, not with your hands. Never look down, and only use light contact on the reins. You have to allow the horse freedom to move his head and neck. When the horse leaves the ground, bend your body forward coming slightly out of the saddle. Once in the air, follow the horse's mouth with light contact, bringing your body even farther forward to maintain the center of gravity. As the horse lands, bring your body back to the normal riding position. And don't fall off! What is really going on when a trained horse refuses to jump? If your horse is refusing to jump, then he or she might be lacking in respect or trust for the rider. Or, even with all the respect and trust in the world, if the rider is not setting up the approach well enough then perhaps the horse is just saying "I can't". If a horse does not have ample respect and trust for the rider then it just can't realistically be expected to go anywhere and do anything that it doesn't really want to do. If you know that you and your horse are in a reliable partnership and you think the problem is solely regarding the jumps, then the next question would be is he or she sound enough to be jumping? But many times, it just comes down to the rider's experience and ability. Read the next horse riding tips article on Dressage Basics.